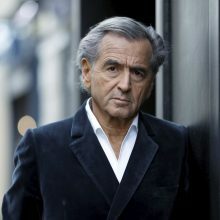 Bernard-Henri Lévy is a French philosopher, filmmaker, activist and the author of over 30 books, including works of philosophy, fiction, and biography. Some examples include:The Empire and the Five Kings (forthcoming from Henry Holt), The Genius of Judaism (2017), American Vertigo: Traveling America in the Footsteps of Tocqueville (2006), Left in Dark Times: A Stand Against the New Barbarism (2008), and, with Michel Houellebecq, Public Enemies: Dueling Writers Take on Each Other and the World (2011). His 1977 book Barbarism with a Human Face launched an unprecedented controversy over the European left’s complicity with totalitarianism. Lévy has undertaken diplomatic missions for the French government and was appointed by French President Jacques Chirac to head a fact-finding mission to Afghanistan in 2002 in the wake of the war against the Taliban. He followed the trail of Daniel Pearl in Pakistan to research his bookWho Killed Daniel Pearl? (2003). A subsequent book, War, Evil, and the End of History (2004), took him to war sites of Colombia, Sri Lanka, Burundi and the Nuba Mountains. His reportage and commentary from Israel during the 2006 Lebanon war appeared in the New York Times Magazine. He reported on the ethnic cleansing and genocide in Darfur in 2007 in Le Monde and The Financial Times. His first-hand account of the fall of Moammar Gaddafi in Libya appeared in the form of a writer’s journal (La Guerre sans l’aimer, 2012) and a film, The Oath of Tobruk (Offficial Selection Festival de Cannes 2012) . In 2016, Lévy’s documentary, Peshmerga, premiered at the Cannes Film Festival. Filmed in 2015 along the thousand-kilometer front separating the Iraqi Kurds from the forces of the Islamic State, Peshmerga was the centerpiece of the New York Jewish Film Festival in January 2017. Lévy’s second documentary on Kurdistan,The Battle of Mosul, explored the fight to re-take the city of Mosul from the Islamic State and premiered in Europe in March 2017. Earlier documentaries include Bosna! (1994). In London June 2018, Lévy performed “Last Exit Before Brexit”, a one-man play he wrote about the perils of the European dream in the face of populism. His play “Hotel Europe” premiered in Sarajevo and Paris in 2014 and similarly, was a cry of alarm about the crises facing Europe. Lévy is a columnist for The Wall Street Journal, The New York Times, Foreign Policy, Vanity Fair, CNN, Tablet Magazine, The World Post, Le Point, La Stampa, El País, The WorldPost and others.